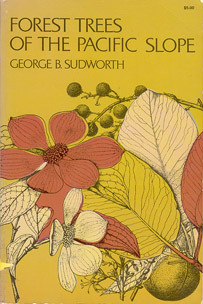 Written more than 50 years ago, Sudworth's hand­book is still recom­mended by forestry services as the most practical and comprehensive guide to the native tree species of the Pacific slope. George Sudworth (1864-1927), Chief of Dendrology for the federal Forest Service Department, gathered the material for this book from thousands of acres of forest land at a time when much of the American western country was wilderness, reachable only by pack train or on foot." Admired for its eloquent forest description, and with the most complete information on the trees available in handbook form, this book lists over 150 species. Sudworth notes for each its distinguishing characteristics, its extreme and average size, its range (in particular detail), its habitat, its morphology, its method of reproduction, its commercial value, and its length of life. Drawings of all but a very few of the tree species supplement the text. As will be seen by leafing through the book, these are of remarkable beauty and accuracy. Wherever possible, the drawings picture a leaf, seed, branch, fruit, or flower drawn to actual size. The student is encouraged to hold a similar sample against the, drawing to verify the identification of the tree. For residents of Alaska, the Yukon, British Columbia, Alberta, Washington, Oregon, California, and western Nevada, for those planning a trip to the West, and for nature enthusiasts and students of forestry in general, this excellent, easy-to-use text with its magnificent drawings is the finest field guide available to Pacific slope tree species. Unabridged republication of 1st (1908) edition. Foreword to the Dover edition by Woodbridge Metcalf, Extension Forester, Emeritus, the University of California, Berkeley. 2 maps. 207 figures. 6 photographs, new to this edition. New table of changes in nomenclature by E. S. Harrar, Dean of the School of Forestry, Duke University. Index of common and scientific names. xvi + 455pp. 6 1/8 x 9 ¼. A DOVER EDITION DESIGNED FOR YEARS OF USE ! We have made every effort to make this the best book possible. Our paper is opaque, with minimal show-through; it will not discolor or become brittle with age. Pages are sewn in signatures, in the method traditionally used for the best books, and will not drop out, as often happens with paperbacks held together with glue. Books open flat for easy reference. The binding will not crack or split. This is a permanent book.